You probably find it attractive to see white smoke, coming out the exhaust pipes of roaring “hot wheels” in the movies, however, that surely mean no good in real life if the white smoke continues to come out while your car is running. It could be a sign of a warped cylinder head issue or a head gasket failure. There are many contributing factors that I don’t even want to think about how complicated they are. 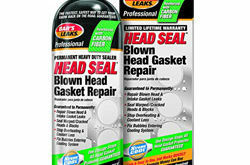 There are lots of ways to diagnose and uncover the culprits that cause head gaskets to fail. Regardless of the year, make, and model, none of us are an exception of this. The Verdict: Is “Steel Seal” Seals Like The Man Of Steel? Without the time, the knowledge or the money to properly repair a head gasket issue, it does not hurt to try a better and safe solution, right? Anyway, this is not about my vehicle, what I am only pointing out based on my own experience is that early detection of failing head gaskets is the key to keeping the repair costs down. Meaning, taking it to a repair shop or going through the trouble of removing the organs of your car just to find out if there is a need for the head gasket to be replaced should be the LAST OPTION. Why? Because the labor cost alone is a minimum of $1200. Let’s face it, if you own a Subaru, chances are, you’ve caught wind of the cylinder head gasket failures. This problem has been hounding many of the Subaru models, especially the 1st generation class. I have a 2003 Subaru Outback H6 6 Cyl 3.0L, and for the past seven days, I was constantly dealing with my car idling rough and the engine overheating as early as 60,000 miles! This is my first ordeal with such a problem, and I am just not comfortable paying a grand to hand it over to a mechanic to take my engine apart without trying something else that will not make my brain sick and my bank account bleed. 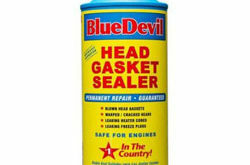 Just like its famous rivals BlueDevil and Bar’s Leaks, this brand is also leading as one of the best head gasket sealers in the market. 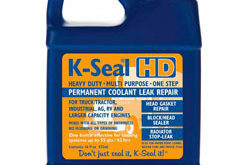 Steel Seal is famous for the impressive repair longevity of its durable seal. 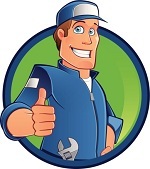 It is a formula created to save you from spending a big amount of hard-earned-cash for a, particularly very expensive car problem, which we are no strangers about. It’s a clear, green liquid (like a mountain dew soft drink) without any solids in it. It will not clog your radiator system. 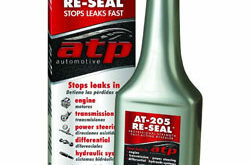 A product like Steel Seal is made to rescue neglected vehicle maintenance, and in every auto sealant, we are obviously going for the brand that is tough on leaks but gentle on the budget. That’s the whole reason we want to skip the auto repair shop, to begin with, right? To the exemption of a more critical head problem, certifiably so. 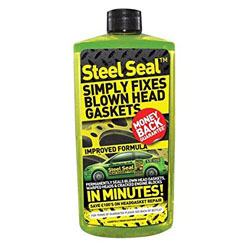 I did my own research and as I scouted the internet one of the miracle products highlighted by google is “Steel Seal Blown Head Gasket Fix Repair Sealer,” without further ado I called up the tech line and asked questions about it before I watched the reviews on YouTube about this product. The tech guy on the phone gave me additional instructions on how to properly use it. He also gave me a heads up that this formula is not compatible with all antifreeze formulations, which I have no problem following. I went to Autozone and bought the 24oz since I have a 6 cylinder engine. I did exactly what the directions says at the back of the bottle. While the engine is cold, I drained my radiator and then top off with water. I poured the entire bottle, started the engine, turned the fan and heater on full blast. Lastly, left it at high idle for thirty minutes. Observing it for a little over two weeks I kept checking my radiator every so often for loss of cooling. I received great results. My vehicle runs smoothly again, no more engine overheat! DO I Recommend It? – Definitely! You probably find it attractive to see white smoke, coming out the exhaust pipes of roaring “hot wheels” in the movies, however, that surely mean no good in real life if the white smoke continues to come out while your car is running.